Credit card and debit card payments are due at the time of registration. If paying by credit card or debit card, DO NOT PUT IN A ZIP CODE FOR SHIPPING FEES, as nothing will be shipped and we have no way to refund the shipping charge. If paying by check, we must receive the check no later than eight (8) days after you register. Cancellations received by email at desertsleuths@gmail.com no later than June 15, 2019 – OR – postmarked no later than June 15, 2019 and received at the Desert Sleuths mailing address, will receive a full refund, minus $25.00. No refunds after June 15, 2019. Special Student Registration – SATURDAY REGISTRATION ONLY. The Sisters in Crime Desert Sleuths Chapter supports and encourages students who wish to pursue a writing career. A special student rate is available for the 2019 WriteNow! Conference with the following restrictions: 1) Students must be between 14-years-old and 22-years-old; 2) Students must provide an identification card that shows the student is currently enrolled in a middle school, high school, college or university at check-in on Saturday morning; 3) Student registration is for the Saturday program only. Sisters in Crime Desert Sleuths Chapter members who have fully paid both their Desert Sleuths 2019 membership dues and their 2019 Sisters in Crime National dues will receive a significantly discounted rate. Dues for 2019 must be current at the time of registration. * Membership will be verified. Members of other Sisters in Crime chapters and Sisters in Crime National who have paid their 2019 membership dues can purchase conference registrations at a discounted rate. Dues for 2019 must be current at the time of registration. * Membership will be verified. 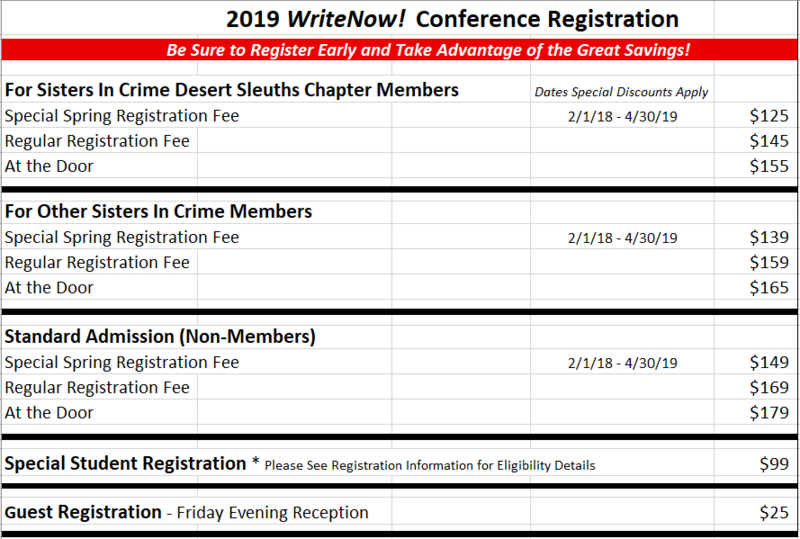 *Sisters in Crime Desert Sleuths Chapter members who register under the Sneak Preview discount – or – the Early Bird discount must have paid their 2019 Desert Sleuths Chapter dues and their 2019 Sisters in Crime membership dues no later than February 1, 2019. Additionally, members of other SinC chapters and Sisters in Crime National who register under the Early Bird discount for “Other SinC members” must have paid their 2019 Sisters in Crime and chapter dues no later than February 1, 2019. Pitch sessions and the Friday evening reception are reserved exclusively for those registering for the 2019 WriteNow! Conference. Thank you. 2019 Membership in both SinC national and the Desert Sleuths Chapter is required for this discounted price and will be verified. Admission to the Friday evening reception is included in this ticket price. 2017 Membership in SinC national is required for this discounted price and will be verified. Admission to the Friday evening reception is included in this ticket price. These tickets are available to non-members. Admission to the Friday evening reception is included in this ticket price. STUDENTS (Restricted to 14-22 years old) SATURDAY REGISTRATION ONLY. Pitch your novel directly to literary agent Abby Saul, founder of The Lark Group. Abby is currently seeking adult fiction only in the following genres: mystery, thriller, suspense, women’s fiction (upmarket and commercial), historical fiction, and select literary fiction. She “likes fiction that is character-driven and smart”. *Pitch Sessions are an optional opportunity available for a separate fee. Only individuals who are registered for the actual 2019 WriteNow! Conference may sign up for a pitch session. If this pitch session is sold out please sign up on the waitlist here. Pitch Your Book to an Agent Pitch your novel directly to literary agent Abby Saul, founder of The Lark Group. Abby is currently seeking adult fiction only in the following genres: mystery, thriller, suspense, women’s fiction (upmarket and commercial), historical fiction, and select literary fiction. She “likes fiction that is character-driven and smart”. Pitch your book to Editor Terri Bischoff returns for the 2019 WriteNow! Conference. Bischoff has dramatically increased the number of titles per season for publishers and expanded the type of crime fiction printed. She has signed multiple Sisters in Crime authors—including Desert Sleuths—to publishing contracts. Don’t miss this opportunity to pitch your mystery, thriller or other crime fiction novel to Terri. Pitch Your Book to an Editor Pitch your book to Editor Terri Bischoff returns for the 2019 WriteNow! Conference. Bischoff has dramatically increased the number of titles per season for publishers and expanded the type of crime fiction printed. 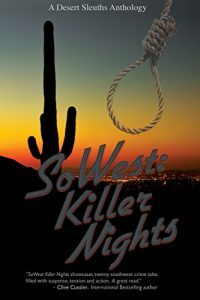 She has signed multiple Sisters in Crime authors—including Desert Sleuths—to publishing contracts. Don’t miss this opportunity to pitch your mystery, thriller or other crime fiction novel to Terri.